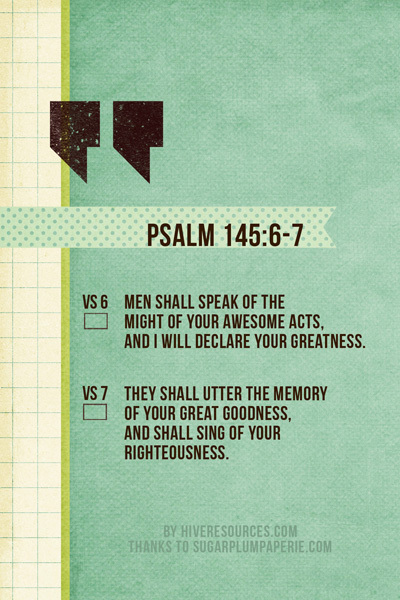 This is the fourth post in a series on Psalm 145 – a passage with lots to say about your life! So, subscribe today! You don’t miss the next free printable! I field odd-ball questions from my children about God when I’m in the middle of a task. Yesterday, one of the twins asked me ‘if God was a killer’ as I was juggling a pot of boiling of water over his head. I was prepping for dinner. Often, I’m quick to dismiss these honest questions about God as silly because I’m genuinely busy. I’m also tempted to sweep difficult questions under the rug when I don’t feel I have adequate answers. But Psalm 145 encourages me to stop and consider genuine questions as priceless teaching moments (as long as there isn’t a pot of boiling water involved). Click on image to download high res version. 1. 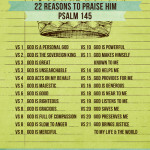 TALK ABOUT WHO GOD IS! Teaching our children to fear God starts when we talk with them about God in a reverential way. In verse 6, David says God is awesome. He is great. David says when men speak about God, they talk about the might of his awesome (or terrible) acts. It’s hard to use casual terms about God when talking about the powerful things he does. So, parents, we must be ready to talk about God when our child is. Take time to really answer your kid’s questions about God by digging for answers together. I can’t think of anything more exciting than for a parent to invite their child on an adventure to find answers for questions big and small (sort of like a treasure hunt!) Put the child on your lap and Google safe questions. Take the child’s hand and guide them to the bookshelf. Select a book together and then look up answers with their help. Trace the words of Scripture with your child’s finger. Besides learning truths about God’s character, the child also learns how to handle Scripture and apply it to life’s questions. They learn that Mom and Dad listen. They learn they can feel comfortable talking about faith with their family. They learn that Scripture is robust enough to handle their inquiry. And they learn that God desires to make himself known – especially to them. 2. CELEBRATE WHAT GOD DOES! Teaching our children to fear God starts when we teach them to celebrate what he does! So, how do you celebrate God? Basically, a heart that truly fears God cannot help but celebrate what God does. In this passage, God’s goodness refers to his kindness to mankind manifested in his righteousness (tsedaqah) or justice. That means God always does the right thing. But God is righteous not simply because he always does what is right – but because he always does what is right toward us. He brings justice into our lives by giving us his righteousness. Like David said, that’s cause for celebration…and great fear. Use today’s printable as a reminder to be intentional about guiding your children in the fear of the Lord. He is awesome, great, good, and just! And he seeks to share all that with them! What kind of odd-ball questions about God do your children ask you? And how do you answer them? Special thanks to Sugarplum Paperie for granting me permission to use her lovely designs for this printable! Love this, Melissa! And love the printables!!! thanks Desire! Tomorrow is the last day in this series!